With the cold weather we've been having lately (it was 5 degrees last night! ), I've been craving something warm and comforting to eat. The hubs and I decided that homemade mac & cheese was just the ticket. We took a recipe from Ina Garten (have I mentioned that I like her??) from her "Family Style" cookbook. Drizzle oil onto large pot of boiling salted water. 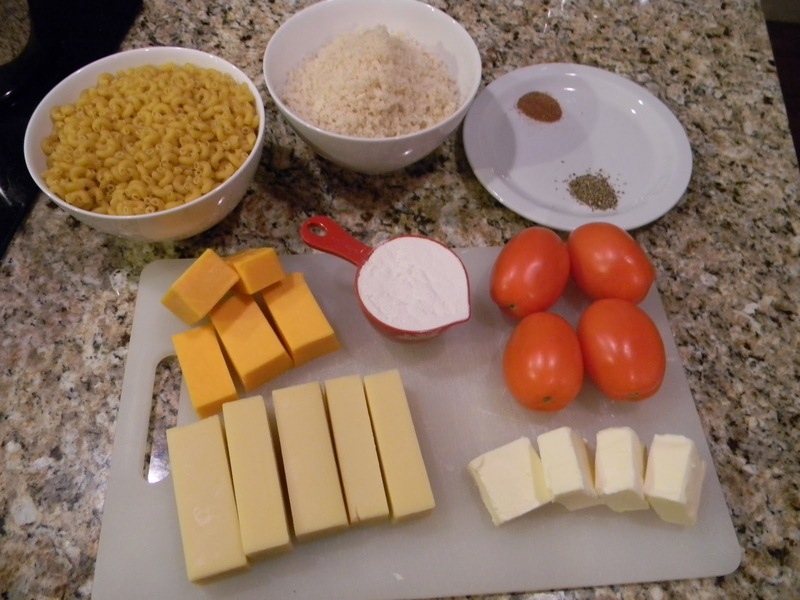 Add the macaroni and cook according to the directions on the package, 6 to 8 minutes. Drain well. Meanwhile, heat the milk in a small saucepan, but don't boil it. Melt 6 tablespoons of butter in a large (4-quart) pot and add the flour. Cook over low heat for 2 minutes, stirring with a whisk. While whisking, add the hot milk and cook for a minute or two more, until thickened and smooth. Off the heat, add the Gruyère, Cheddar, 1 tablespoon salt, pepper, and nutmeg. Add the cooked macaroni and stir well. Pour into a 3-quart baking dish. Slice the tomatoes and arrange on top. Melt the remaining 2 tablespoons of butter, combine them with the fresh bread crumbs (FYI: we used sliced sourdough and blended in food processor) and sprinkle on the top. Bake for 30 to 35 minutes, or until the sauce is bubbly and the macaroni is browned on top. I honestly don't think I will ever be able to eat mac & cheese out of box ever again. 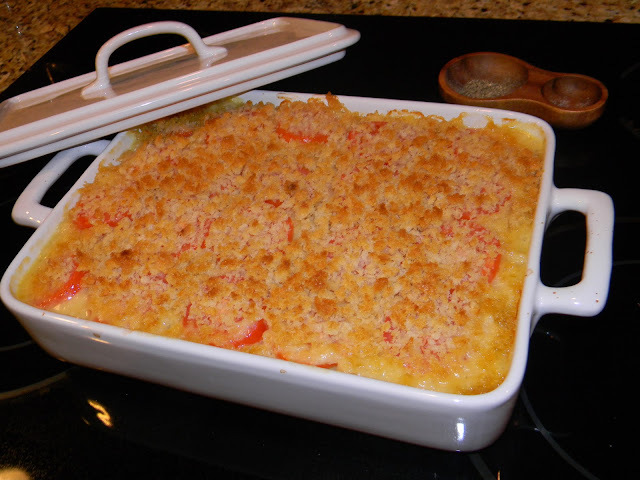 Baked mac & cheese tastes SO much better...the fresh cheese makes the flavors bolder and the bread crumbs on top add a nice crunch. We will definitely make this again soon! Hope you're all surviving this cold streak...according to the groundhog...spring is around the corner...fingers crossed!!! 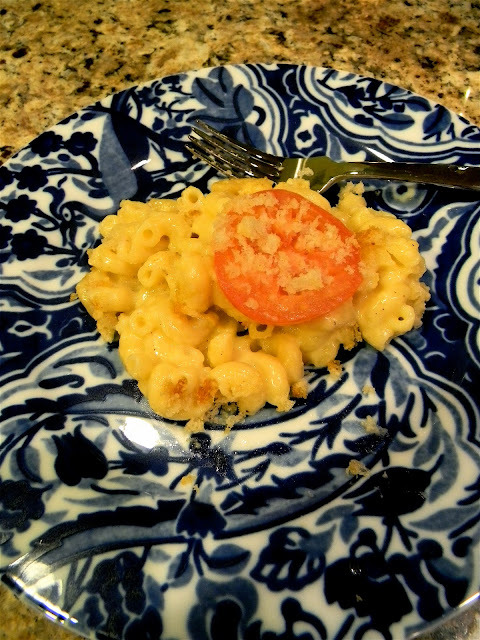 I LOVE homemade mac & cheese - so delicious and perfect for winter! I usually use a Martha recipe when I make it but yours sounds good - I'll have to give it a try. Love the tomatoes on top! The little birds on my mantle are from Target - but I bought them last year! I think they were part of the Smith + Hawkin collection they have. this looks absolutely fantastic. as a matter of fact, this recipe has been on my list to try for a few weeks now. i will definitely have to get my act together and make it one chilly evening! thanks for reminding me. MMMM that looks so yummy! Love anything Ina - I can't believe I haven't made this yet! Perfect for a cold winter's day. Mmm, Mmm good lookin'!!! I have two very picky eaters (three if you count the hubbs) and I think this would definitely be a crowd pleaser! I mean, heck, who doesn't like mac & cheese??? (c: Thanks for visiting the blog, I love making new friends! I have to make this soon. My boys are mac&cheese lovers and I have that cookbook. Thanks for sharing! Aubrey-yes the flavors are great...mild but still flavorful...sure to be a hit! i have been LOOKING for a great mac n cheese fix!! this is def something i may make while staying warm in chilly chicago! thanks girl! love this blog! hyseterical, i don't know I how missed this post! I made this recipe last sunday!!!! I have saved it from Cupcakes and Cashmere blog for over a year... but like Emily, I used horseradish chedder... I love a kick of hot in my mac and cheese.... great minds think a like!